The ruin at Joe Grant Cay. The beach at Joe Grant Cay. 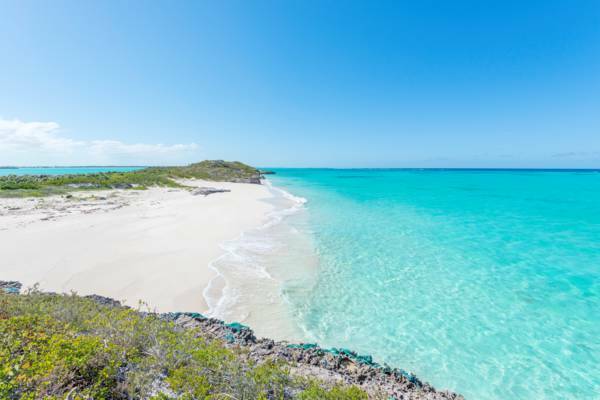 Joe Grant Cay is an undeveloped and uninhabited island in the central Caicos archipelago. It’s bordered on its east side by East Caicos, and on the west by Dickish Cay and Middle Caicos. The island has a total landmass of about 233 acres (94km²) yet much of the southern side consists of mangrove and tidal wetlands. Joe Grant Cay’s foremost feature is the spectacular beach found on the north coast. This beach isn’t quite as extensive as some of the adjacent coasts on the surrounding islands, yet the spectacular turquoise water and soft sand leaves little to be desired. Another incredible beach with a slightly different atmosphere is found at the western side of Joe Grant Cay and across the short channel from Dickish Cay. 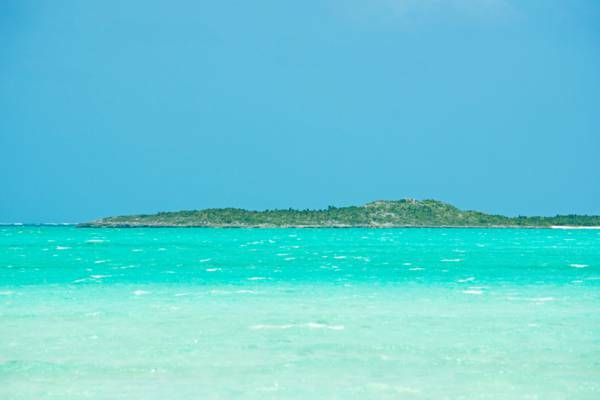 Like many of the channel cays between the larger Caicos Islands, the scenic shifting sand bars and shallow banks here contrast with the blues and emeralds of the deeper waterways, and are a breath-taking sight. Small limestone bluffs that reach heights of 25 feet (7.5m) overlook the northern beach, and at the crest of the central hill here, Joe Grant Cay Point, are the ruins of a small house. This structure appears to date from the mid to late 1800s. There’s also evidence of human habitation inland as well, probably having taken place during the Victorian-era as well. The bluff on the north of Joe Grant Cay. The landscape of Joe Grant Cay is similar to many of the channel cays in the Caicos Islands. The terrain is general of very low elevation, and dense low height tropical dry forest covers much of the dry ground. The eastern peninsula of the island features one of the thickest casuarina tree forests in the Turks and Caicos. These invasive trees tower above the native vegetation and often replace existing dune flora. An interesting natural feature are small Karst process sinkholes that can be found in the inland tropical dry forest. Sinkholes are very common throughout the Turks and Caicos, yet most examples do not reach the water table. 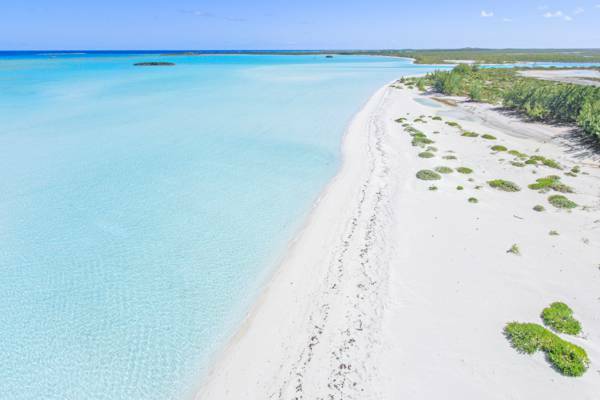 Several of the holes on Joe Grant Cay do reach water, and although of salinity roughly equal to the surrounding ocean, the water is crystal clear – quite unusual for the country. Small cave shrimp live in a few of these holes, likely the same critically-endangered Sterrer’s cave shrimp (Parhippolyte sterreri) that’s found in a few underwater caves on East Caicos and Providenciales. Great flotsam beachcombing can be found on the eastern side of the island amongst the casuarina forest. There are bottles of every age, floats, drift wood, and other treasures. Joe Grant Cay is very rarely visited, and it’s not easy to get to. The simplest way is to drive to Cedar Point on Middle Caicos, and wade and swim the channels and walk the beaches, which is about one mile (1.6km) collectively. It’s also possible to kayak the same route. Another option is to arrange a custom charter with a local fisherman or boat tour company. Dickish Cay with Joe Grant Cay in the distance. Last reviewed by an editor on 7 August 2017.